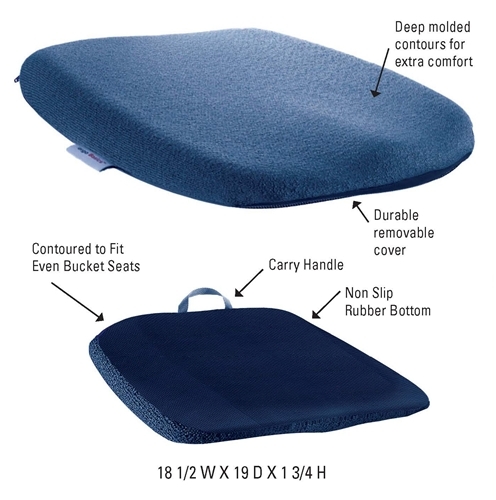 Visco-elastic memory foam seat cushion is designed specifically for car bucket seats. Anatomical contour relieves pressure and reduces fatigue on long drives. Tapered front design supports your pelvis and legs for better posture. 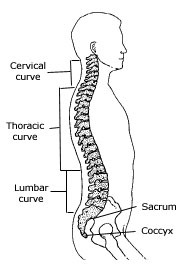 Choose the optional coccyx cutout if you have tailbone sensitivity. Slim-profile fits most autos, trucks, SUVs, even airplane and train seats. Easy to take with you wherever you go. Can also be used in chairs where a gentle forward slope is preferred. Looking for something a little smaller? 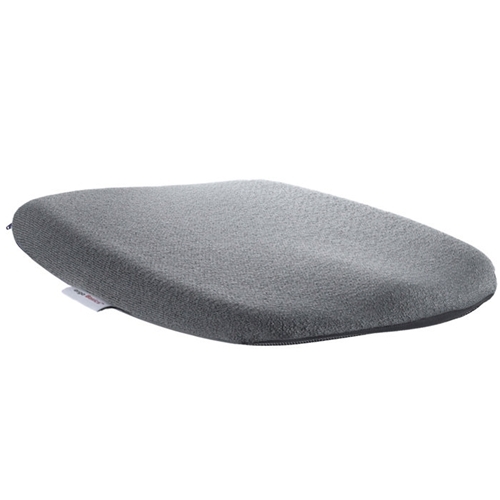 We suggest the Contour Cush for folding chairs, dining chairs, deck chairs, and stadium seats. Medical grade Comfort-Ease, the newest generation of high-density memory foam, provides luxurious support. Removable washable cover is soft and stretchy for comfort, yet durable enough for years of use. 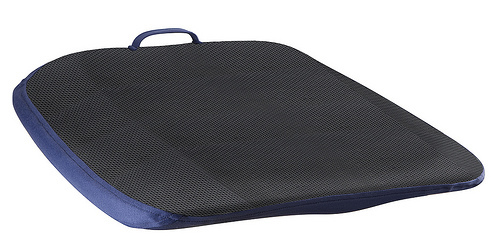 100% polypropylene nylon Teknit fabric is cool to sit on. Sponges clean with soap and water. High-grade rubberized non-slip bottom and reverse bottom contour fits securely into bucket-shaped car seats. 19"L x 18.5"W x 1.75"H. 4 lbs.